This whimsical ocean-themed hotel's distinctive circular shape offers stunning panoramic views, surrounded by shopping, dining and ocean activities. All rooms have private lanais, most with an ocean view. Playful ambiance, beach proximity and affordability make this a much sought-after jewel in Waikiki. Across the street from Waikiki Beach. 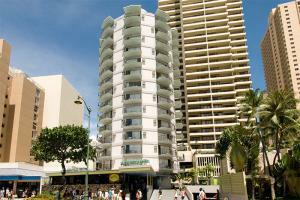 Next to Aston Waikiki Beach Tower and Beachside, between the Pacific Beach Hotel and Hyatt Regency Waikiki. Approximately 40 minutes from Honolulu Airport.